It all starts with a single octahedron structure, then after four iterations there are already 625 of them. Each iteration creates a new octahedron at each vertex. 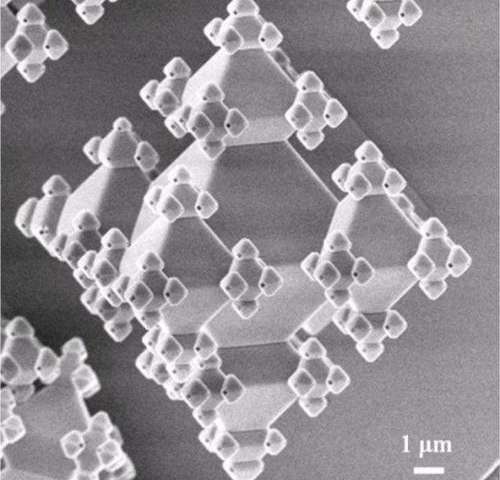 The result is a fascinating 3D fractal construction on micro and nanoscale, suitable e.g. for high-performance filters. Researchers at the University of Twente's MESA+ Institute for Nanotechnology present this invention in the Journal of Micromechanics and Microengineering. A geometrical figure can repeat itself ad infinitum in a fractal. As you zoom in you keep seeing the same structure. 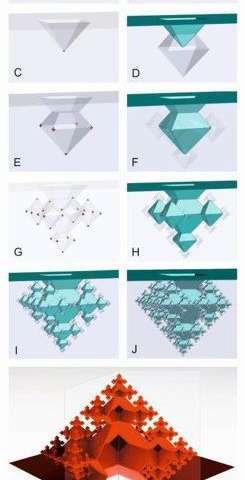 The big advantage of a three-dimensional fractal is that the effective surface area increases with each diminution and at the same time the space is used to the full. In the case of the octahedrons the final structure is not much larger than the original octahedron but the effective surface area has grown by a factor of 6.5. The smallest octahedra are 300 nanometres in size with tiny holes at the vertices 100 nanometres in diameter. 625 of these nanopores on a small area can create a highly effective filter with very low flow resistance, for example. The octahedra can also be used as tiny cages to hold living cells and examine their interactions with cells in neighbouring octahedra. And what happens if you direct light into the structure? The possibilities are legion. In order to create the repetitive three-dimensional structure the researchers use a technology which they have developed themselves, known as 'corner lithography'. First a pyramid shape is etched into silicon, then a thin layer of silicon nitride is applied. This is removed, leaving a tiny amount of silicon nitride in the vertices, a sort of plug. This too is removed so that more etching can take place through the hole thus created. The octagonal 3D structure forms of its own accord along the crystalline planes of the silicon by 'auto-alignment'. Silicon nitride is again applied to each vertex and the process is repeated. The new structure automatically unfolds in each direction, with the size of the new octahedra depending on the etching time. 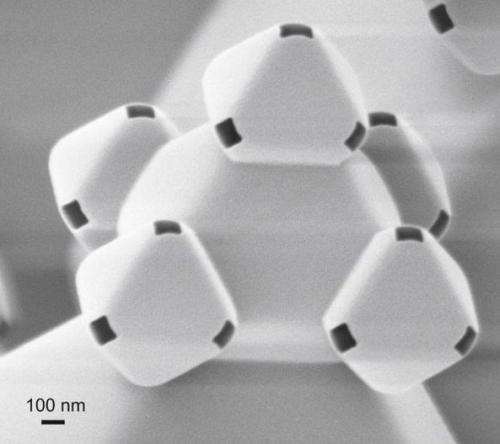 The structure thus develops from micrometres to nanometres. One of the big advantages is that no complex technology is needed to make the pores one by one, for example. Millions of the fractals can be created in parallel on a wafer, each with 625 pores. More than four iterations can be employed, but this does places greater demands on the technology and the precision of the etching process. The research was conducted by the Transducers Science and Technology Group of the University of Twente's MESA+ Institute for Nanotechnology. The article, 'Fabrication of 3D fractal structures using nanoscale anisotropic etching of single crystalline silicon' by Erwin Berenschot, Henri Jansen and Niels Tas, is on the cover of the May issue of the Journal of Micromechanics and Microengineering.